I love reading books that are authentic: that are true to real life, that make me feel something, that I resonante with. Because of this I've really gotten into reading memoirs over the last couple of years. 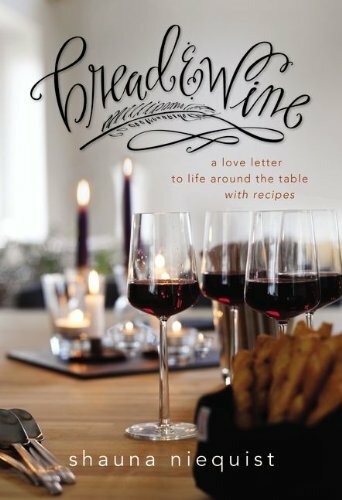 My love for cooking has made me especially fond of food memoirs, and I recently finished Bread & Wine. It reminds me of A Homemade Life: good recipes and heartfelt essays about life around those recipes. Shauna takes some of her go-to recipes and shares the stories of life and friendship and family that revolve around each of those recipes. The recipes all look good, but I really loved how transparent she was in writing about life. She shared the struggle of balancing work and family, the heartache over her miscarriage, the shame of feeling overweight and eating all the time. The entire tone of the book is straight-forward and honest, and I love that. It's also her philosophy in cooking and entertaining, that it "isn't a sport or competition. It's an act of love, if you let it be. You can twist and turn it into anything you want--a way to show off your house, a way to compete with your friends, a way to earn love and approval. Or you can decide that every time you open your door, it's an act of love, not performance or competition or striving. You can decide that every time people gather around your table, your goal is nourishment, not neurotic proving." The entire book is a celebration of both food and life, and it was a beautiful read. It just came out yesterday and you can buy it here! Note: I received this book from the publisher for reviewing purposes, but this opinion is 100% my own. I really liked this book! Oh definitely looking forward to reading this! I've heard great things from multiple people. Thanks for sharing your thoughts on it! That sounds like a great book...I think I will have to check it out! oh yes! yes yes yes to her thoughts on entertaining. it is about love, not showing off, or trying to make it seem like you have it all together. and reading a book like this vs. gwenyth's new tome (how many food groups can she cut out of her and her seven-year-olds diet!) is much more my speed - real, authentic, honest. Ooh will have to check it out for sure! Of the book...and it sounds like it's awesome info too! !